OVERVIEW: This guide explores the nature of the shadow and provides tips and exercises for daily shadow work. It’s always standing right behind us, just out of view. In any direct light, we cast a shadow. The shadow is a psychological term for everything we can’t see in ourselves. I understood how important knowing my shadow was when I wrote a biography of a spiritual teacher. Most of us go to great lengths to protect our self-image from anything unflattering or unfamiliar. And so it’s easier to observe another’s shadow before acknowledging one’s own shadow. Seeing the shadow of this teacher helped me understand how someone can show gifts in one area of life while remaining unaware of poor behavior in other areas. Every human being is susceptible to this. I find working with my shadow a rewarding, yet challenging process. Exploring your shadow can lead to greater authenticity, creativity, energy, and personal awakening. This introspective process is essential for reaching mature adulthood (which is rarer than most think). The shadow is the “dark side” of our personality because it consists chiefly of primitive, negative human emotions and impulses like rage, envy, greed, selfishness, desire, and the striving for power. All we deny in ourselves—whatever we perceive as inferior, evil, or unacceptable—become part of the shadow. Anything incompatible with our chosen conscious attitude about ourselves relegates to this dark side. The personal shadow is the disowned self. This shadow self represents the parts of us we no longer claim to be our own, including inherent positive qualities. These unexamined or disowned parts of our personality don’t go anywhere. Although we deny them in our attempt to cast them out, we don’t get rid of them. We repress them; they are part of our unconscious. Think of the unconscious as everything we are not conscious of. We can’t eliminate the shadow. It stays with us as our dark brother or sister. Trouble arises when we fail to see it. For then, to be sure, it is standing right behind us. Every young child knows kindness, love, and generosity, but he also expresses anger, selfishness, and greed. These emotions are part of our shared humanity. But as we grow up, something happens. Traits associated with “being good” are accepted, while others associated with “being bad” are rejected. We all have basic human needs. These needs include physiological needs, safety and security needs, and needs for belonging. These needs are biological and instinctual. As children, when we expressed certain parts of ourselves, we received negative cues from our environment. Maybe we got angry and threw a tantrum. Our parents reprimanded the outburst and sent us to our room. Or perhaps we acted boldly, playfully, spontaneously, or silly in our first-grade classroom. Our teacher shamed us for our lack of decorum in front of the class and told us to sit down. Whenever it happened—and it might have happened often—it threatened one of our basic needs. Would the disapproval of our parents threaten our safety? Would the disapproval of our teachers and classmates jeopardize our need to belong? We adjusted our behavior to gratify our needs and learned to adapt to the external world. All the unaccepted or discouraged parts of us in the first 20 years of our lives are bundled together, swept out of view (outside our conscious awareness). As poet Robert Bly says in A Little Book of the Human Shadow, the child puts all of these unwanted parts into an invisible bag and drags it behind him. This repression of unwanted parts creates what psychologist Carl Jung called the personal shadow. The ancient Greeks understood the need to honor all of the parts of the psyche. For them, these parts were worshiped as autonomous gods and goddesses. The Greeks knew a god or goddess you ignored became the one who turned against you and destroyed you. Any part we disown within us turns against us. The personal shadow represents a collection of these disowned parts. We do things we wouldn’t voluntarily do and later regret (if we catch it). We say things we wouldn’t say. Our facial reactions express emotions we don’t consciously feel. 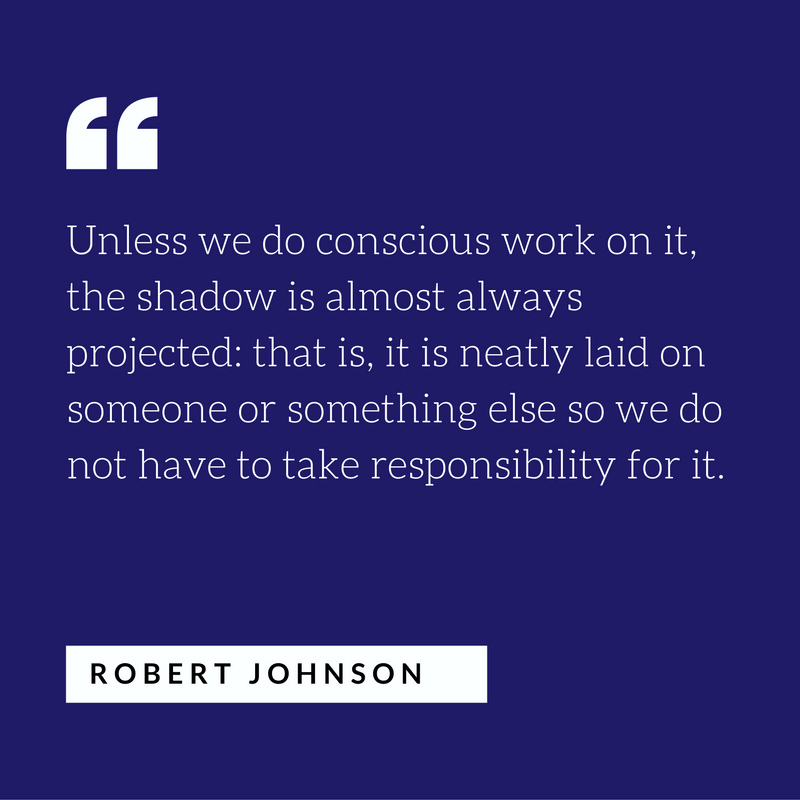 Remaining unconscious of the shadow hurts our relationships with our spouses, family, and friends, and it will impact our professional relationships as well as our leadership abilities. Do you remember Robert Louis Stevenson’s Dr. Jekyll and Mr. Hyde? Dr. Jekyll was a respectable gentleman (the “good,” conscious side of the personality) who took a potion to separate out his darker impulses to create a creature free of conscience named Mr. Hyde (the personal shadow). Dr. Jekyll could not control the actions of his darker half, leading him to commit unscrupulous acts, including murder. Such is the fate, although often not so severe, of anyone who denies his or her shadow. So what happens to all the parts of ourselves we sweep out of view? Whatever qualities we deny in ourselves, we see in others. In psychology, this is called projection. We project onto others anything we bury within us. If, for example, you get irritated when someone is rude to you, it’s a good bet you haven’t owned your own rudeness. This doesn’t mean the person isn’t being rude to you. However, if rudeness wasn’t in your shadow self, someone else’s rudeness wouldn’t bother you so much. This process doesn’t happen consciously. We aren’t aware of our projections. Our egos use this mechanism to defend itself—to defend how it perceives itself. Our false identities of being “good” keep us from connecting to our shadow. These psychological projections distort reality, creating a thick boundary between how we view ourselves and how we behave in reality. The shadow isn’t a popular topic. Who enjoys owning their flaws, weaknesses, selfishness, nastiness, hate, and so on? Focusing on our strengths is more enjoyable and life-affirming. Exploring our shadow side, however, gives us tremendous opportunities for growth and development. As you integrate your shadow side and come to terms with your darker half, you see yourself more clearly. You become more grounded, human, and whole. When you can accept your own darker parts, it is easier to accept the shadow in others. As a result, other people’s behavior won’t trigger you as easily. You’ll also have an easier time communicating with others. You may notice an improvement in your relationships with your spouse, family members, friends, and business associates. In seeing others and yourself as you are, you’ll have a cleaner lens with which to view the world. As you integrate your shadow self, you’re approaching your authentic self, which gives you a more realistic assessment of who you are. You won’t perceive yourself as being too big (inflated) or too small (deflated). When you’re self-aware, you can assess your environment more accurately. You’ll see others and evaluate situations with greater clarity, compassion, and understanding. Dragging around this invisible bag of stuff behind us is draining. It is exhausting work to continually repress and suppress all of the parts of ourselves that we don’t want to face in our adulthood. Fatigue and lethargy can plague the unexamined life. Mental suppression can also lead to physical pain and disease. Dr. John Sarno has healed thousands of patients of chronic back pain by helping them acknowledge the repressed rage in their unconscious. With shadow work, you liberate a tremendous reservoir of energy you were unconsciously investing in protecting yourself. This can improve your physical, mental, and emotional health. Shadow work can bring you inner strength and a greater sense of balance, making you better equipped to take on life’s challenges. As long as we deny our shadows and repress certain parts of ourselves, a sense of wholeness and unity is elusive. How can we feel a sense of wholeness and balance with a divided mind? Integrating the shadow brings you one step closer to realizing a sense of wholeness. It’s a critical step to achieving mature adulthood. One of the greatest benefits of shadow work is that it unlocks more of your creative potential. Creativeness, as psychologists like Abraham Maslow and Carl Rogers found, is a spontaneous occurrence in mentally healthy (integrated) individuals. This is perhaps the most important thing to do before you engage in shadow work. Yet, it’s almost never mentioned in literature about working with the shadow. If you attempt to get to know your shadow self when you’re not centered in your Self, you won’t get constructive results. The shadow represents a cluster of various parts hidden within yourself psyche. Only from your Center can you get to know these parts. If one of these parts is “blended” with you, it will hijack the process. You’ll be judgemental, critical, or confused. This will inhibit your shadow work. Before you begin working with your shadow, you want to be a calm, clear, neutral space. That is, you want to be in your Center. Before you get to know your shadow, it is helpful to cultivate a sense of unconditional friendliness with one’s self. In Buddhism, it’s called Maitri. Without friendliness and self-compassion, it is difficult to look at our darker stuff. If you’re hard on yourself when you make mistakes, it is difficult to confront your shadow. If you’re accustomed to feeling shame or guilt, you need to transmute these emotions with friendliness, self-acceptance, and self-compassion. Start by accepting your own humanness. 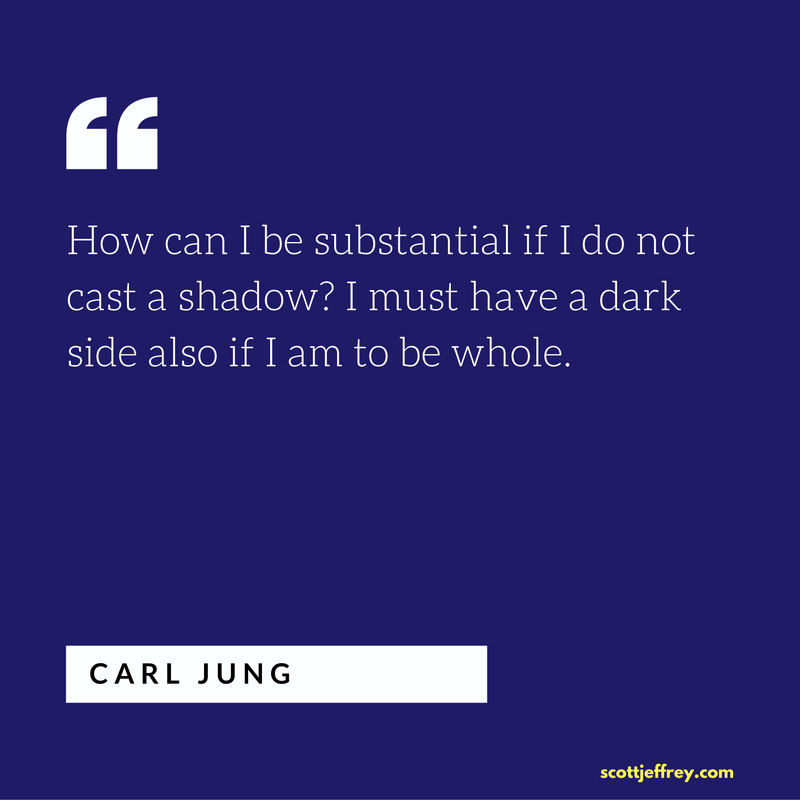 Remember that we all have a shadow—everyone is in the soup together, as Jung used to say. I find it helpful to connect to my heart: place your attention on your heart. Breathe in and acknowledge your heart. Breathe out and say to your heart, “Thank you.” It’s a simple Buddhist practice offered by Thich Nhat Hanh. Seeing the shadow requires a self-reflective mindset—the ability to reflect and observe our behaviors, thoughts, and feelings. Mindfulness meditation helps foster nonjudgmental awareness—the ability to stay aware of the present moment without involving the inner critic or other modes of judgment. Self-awareness and self-reflection are a precursor to shadow work because they help us observe and evaluate feelings and emotional reactions without judgment or criticism. If you need an easy and powerful place to start, check out my audio program, The Mastery Method. Self-honesty and integrity are prerequisites for shadow work. It’s easy to give lip service to these qualities, but true self-honesty means being willing to see unpleasant attributes in our behavior and personality. It is often uncomfortable to come to terms with your disowned parts, which is why the ego invests so much energy in repressing them. Seeing and accepting your insecure selfishness and tyrannical nasty parts can be challenging. To take an honest look at your attitudes, behaviors, dark thoughts, and emotions requires courage. The rewards are worth the discomfort, as these honest confrontations with your shadow help heal the splits in your mind. This courageous act unlocks more of your creative potential, opening a new world of possibilities for your psychological development. I find it fascinating how some of our disowned parts want to remain out of our view. Similar to how a dream slips out of mind moments after awakening, our disowned parts can elude us. A writing journal where you record your new discoveries about yourself is a remedy. Writing your insights and reviewing them later helps encode the discovery into your awareness. Remember that the shadow is elusive; it hides behind us. Our defense mechanisms are designed to keep our shadows repressed and out of view. The more you pay attention to your behavior and emotions, the better chances you have of catching your shadow in the act. We tend to project our disowned parts onto other people. One of the best ways to identify your shadow is to pay attention to your emotional reactions toward other people. Sure, your colleagues might be aggressive, arrogant, inconsiderate, or impatient, but if you don’t have those same qualities within you, you won’t have a strong reaction to their behavior. If you’re paying close attention, you can train yourself to notice your shadow when you witness strong negative emotional responses to others. But we rarely have time to work with those emotions on the spot. At the end of the day, it’s helpful to take five or ten minutes to reflect on your interactions with others and your related reactions. Whatever bothers you in another is likely a disowned part within yourself. Get to know that part, accept it, make it a part of you, and next time, it may not evoke a strong emotional charge when you observe it in another. Focus on what and who evokes an emotional charge in you. It doesn’t matter what the emotion is; it’s a clue you are denying something within you. Many forms of inner work require you to engage in an active dialogue with your shadow side. At first, this might seem like a scary idea since we have a belief that only “crazy people” talk to themselves. But all of us have many subpersonalities—numerous unrecognized, autonomous parts in our mind. 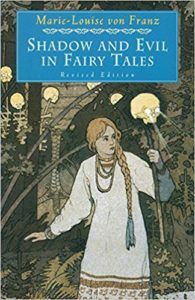 Many different psychologies offer ways of working with these disparate parts, including Jung’s Active Imagination, Schwartz’s Internal Family Systems, Stone and Winkleman’s Voice Dialogue, and Assagioli’s Psychosynthesis. When we don’t pay attention to these parts—one or many of which represent aspects of our shadow—they have a way of influencing our behavior. Have you ever done or said something and then wondered why you did or said it? A part in you was taking charge. Every so-called “accident” is a part hijacking your behavior. Our disowned parts aren’t trying to hurt us, but when we ignore or deny them, they often do. By dialoguing with them in our imagination or in a journal, we can integrate these parts into our conscious selves. Then, they become our allies instead of our enemies. Many of us identify ourselves as being a “good person”. We were praised as children for being a “good boy” or “good girl,” and that identification stuck with us. This intensified the split between our conscious identity and our shadow. Make a list of all of your positive qualities. Then, highlight the opposite. Try to identify the opposite within yourself. For example, if you define yourself as a disciplined person, you’re repressing your lazy part. The lazy part is hiding in the shadow. The disowned is influencing your behavior and constantly challenging your disciplined part. So identify with this lazy part. See it. Accept it. Make friends with it. It’s okay to be lazy too. Perhaps the best way to get to know your shadow is to familiarize yourself with the work of neo-Jungian Robert Moore. Moore has outlined the structure of the psyche in archetypal terms. Moore suggests that the four primary archetypes of the psyche are the King, Warrior, Magician, and Lover. Each archetype possesses qualities we define as the best attributes of mature adulthood. But for each constructive archetype, there is a destructive shadow. And not just one shadow, but two: an active side and passive side (bipolar). For example, the shadows of the King is the Tyrant and the Weakling. The shadows of the Warrior are the Sadist and Masochist. Getting to know these bipolar shadows makes it easier to identify their thoughts and behavioral patterns within yourself. 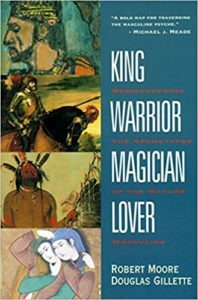 I highly recommend Moore and Gillette’s King, Warrior, Magician, Lover. It’s one of the most important books on psychology I’ve ever read. 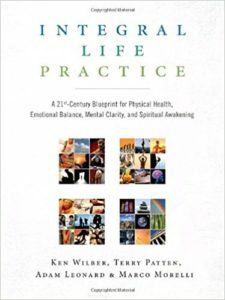 If you want a step-by-step method for shadow work, try the 3-2-1 Shadow Process developed by integral philosophy Ken Wilber in Integral Life Practice. Step 1: Choose what you want to work with. It’s often easier to begin with a person with whom you have difficulty (e.g., partner, relative, boss). This person may irritate, disturb, annoy, or upset you. Or maybe you feel attracted to, obsessed with, infatuated with, or possessive about this person. Choose someone with whom you have a strong emotional charge, whether positive or negative. Step 2: Face it: Now, imagine this person. Describe those qualities that most upset you, or the characteristics you are most attracted to using 3rd-person language (he, she, it). Talk about them out loud or write it down in a journal. Express your feelings. Don’t calculate say the right thing. There is no need to be nice. The person you are describing will never see this. Step 3: Talk to it: Dialogue with this person in your imagination. Speak in the 2nd person to this person (using “you” language). Talk directly to this person as if he or she was there. Tell them what bothers you about them. What are you trying to show me? Imagine their response to these questions. Speak that imaginary response out loud. Record the conversation in your journal if you like. Step 4: Be it: Become this person. Take on the qualities that either annoy or fascinate you. Embody the traits you described in step 2. Use 1st-person language ( I, me, mine). This may feel awkward, and it should. The traits you are taking on are the exact traits you have been denying in yourself. Step 5: Notice these disowned qualities in yourself. Experience the part of you that is this trait. Avoid making the process abstract or conceptual: just BE it. Now you can re-own and integrate this quality in yourself. American philosopher Alan Watts possessed a unique gift for translating complex psychological and philosophical ideas into beautiful, practical, and concise poses. Here’s Watt’s discourse on shadow work. 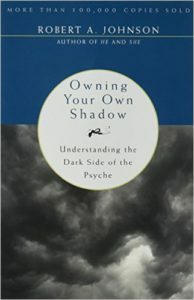 The first book I recommend to anyone interested in learning about the shadow is by Robert Johnson. Johnson has a gift for communicating difficult concepts for us lay readers. Highlights the primary behavioral patterns (archetypes) of mature adulthood and the bipolar shadow archetypes that dominate most of behavior. This book is a must-read for anyone committed to psychological development. 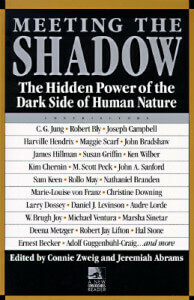 A collection of essays and excerpts from a wide range of writers, psychologists, philosophers, and poets explores and exposes the shadow. It opens your mind to the diverse ways the shadow influences our lives. 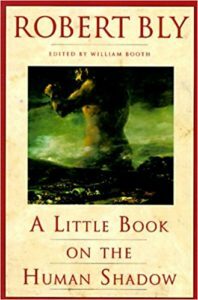 Master poet Robert Bly provides a vivid illustration of the shadow side of human nature through beautiful prose in this concise 81-page book. 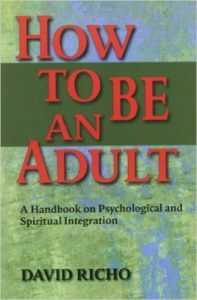 One of the most important books for every adult, regardless of their age. This little book is packed with concise psychological practices for working with negative emotions and growing into adulthood (which doesn’t happen on its own). Also, Ken Wilber, et al.’s Integral Life Practice has an excellent chapter on the shadow with practical exercises to help you work with your shadow.